Oh, how I've missed being in my element! It was definitely hard to be without a kitchen to play in for over the past 2 weeks. Even worse was having to eat out a majority of that time or having a diet of frozen pizza... blah! Now that I have a kitchen that's fully stocked with my fave pantry staples, I finally broke it in with my deep love of burgers... including this California inspired Chicken Burger! During my pregnancy, I've had the biggest cravings for burgers... specifically cheeseburgers. By the end of my pregnancy, I think I could even come close to being a cheeseburger connoisseur lol! Is it sad that I'm not even ashamed that I've had a burger at least 3 times a week... and sometimes everyday for the past few months? My poor husband has put up with it and tonight was no exception. 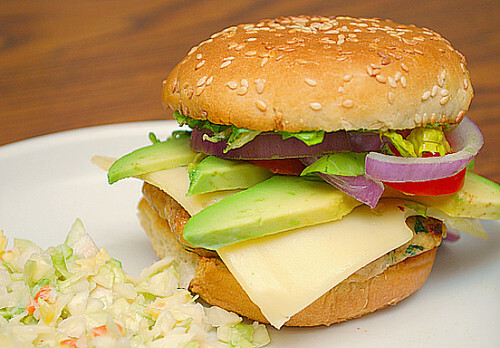 This time instead of the usual beef burgers, I made chicken burgers topped with some colorful and fresh toppings. These chicken burgers couldn't be any easier - ground chicken, Montreal steak seasoning, minced garlic, salt and freshly chopped parsley. Combine these ingredients, form patties and cook! For the California inspired aspect, top these burgers with sliced avocado, sweet red onions, chopped lettuce and your choice of swiss or pepper jack cheese. These burgers go great with your favorite coleslaw recipe or if you're a traditionalist, you can never go wrong with fries. your choice of condiments: mayo, ketchup, mustard, relish, etc. Combine ground chicken, Montreal seasoning, minced garlic, salt and freshly chopped parsley in a large bowl. Don't overwork the ingredients - gingerly mix to fully combine. Cook the burgers on the grill or in a hot skillet using the oil and topping each one with a slice of cheese and a basting cover during the last minute of cooking. Place the burgers on the bun bottoms. Top with toppings and then the bun tops and serve immediately. Hello from California! - These burgers are definitely "our" style out here... nice job and I am excited to find this recipe. mmm burgers :) I am not even pregnant and I could eat them all the time too! I love coming up with new variations. Tonight we had my chicken tequila burgers again, yum! Hmmmm avocados hmmm onions, I probably try this with turkey! The colors of the ingredients between the buns are lovely. A must try for dinner! Superb recipe! Thanks for sharing! Hi there, I saw your photo for this recipe over at Tastespotting last week & have already made these burgers twice!! My bf absolutely loves them and I can't thank you enough for such a great recipe!